Coordinates : 27°N, 23°W – FeluccaThe Tower Academy is a very special kind of establishment. The building was created to host a very useful resource for some of the most infamous Britannian citizens : thieves. 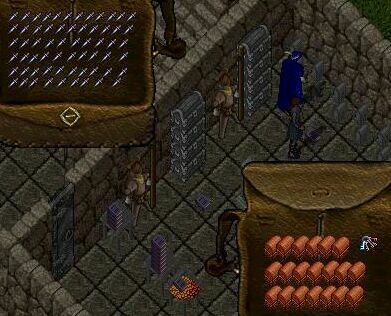 The Tower contains training equipments for the most useful rogue skills, including Stealing (pickpocket dips), Lockpicking and Detect Hidden (Chests), as well as Arms Lore and Item Identification (Skull Caps and Daggers). Few rules must be obeyed while staying in the Academy : visitors are mainly expected to respect each other, and of course not to steal, loot or kill each other. Additional rules include an anti-unattended macroing policy. Inside the training room, many books containing general advice, Frequently Asked Questions, and a copy of the Laws directing the life of thieves in Britannia. The Pickpocket Dip and the Arms Lore items can be freely used, but a small contribution will be requested by Alice, the owner, should you want to be friended to allow you to train your lockpicking. Should you decide to leave a donation after using the facilities of the Tower, a locked down gold stack is located in the training room. To reach the Tower, simply follow the road going from Britain to Yew and go to the northeast after reaching the Brigand outpost.